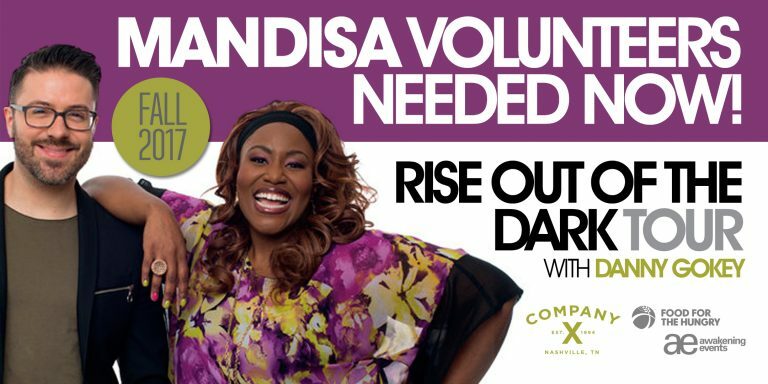 We’re just one month away from the first night of the Rise Out of the Dark Tour -with Mandisa and Danny Gokey, as well as special guests Love and the Outcome and Jasmine Murray- and we’re looking for some volunteers to help out with merch at each show. So if you’re at least 16 years old and want to volunteer to help set up in the morning or run merchandise booths in the evening (or both), click here to register. Volunteers receive complimentary admission to the concert but please come prepared to work during peak times. Questions? Reach out to volunteers@companyxmerch.com.